Once upon a time I would deal with a less than perfect eyeliner if it had a great colour, or if I had just bought, especially if I had just bought it and spent more than $15 on it. I would convince myself it wasn't all that bad- even if it totally was. I've come to learn life is just too short for crappy eyeliner. Agree? 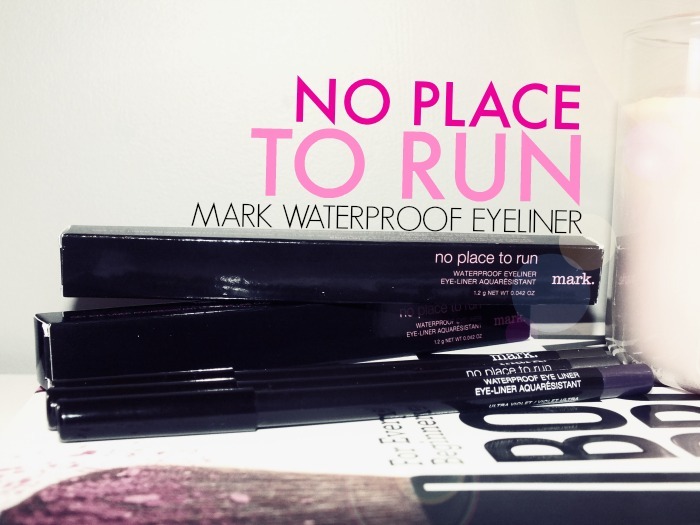 All that said, I was a bit hesitant when the new version of Mark No Place to Run Waterproof Eyeliners found their way to me. How do they fare? Read on! I mentioned these were new version, not a new product. These have been reformulated, but they've also been repackaged. The older versions, which I tried a few years ago, were an all plastic pencil that you were supposed to just sharpen. Yup. Just sharpen over the plastic. I returned my first one because I thought the twist up mechanism was broken- no one mentioned you were supposed to sharpen the plastic. As for the pencil itself, it was okay. The ones I tried had amazing pigmentation, great colour selection, wore really well but were fairly firm and took some effort to apply. A major bummer. So, what about the new No Place to Run Waterproof Eyeliners? They're pretty much perfect! The three shades I received are intensely pigmented, wear all day without smudging, flaking or transferring and have a smooth easy to apply texture. 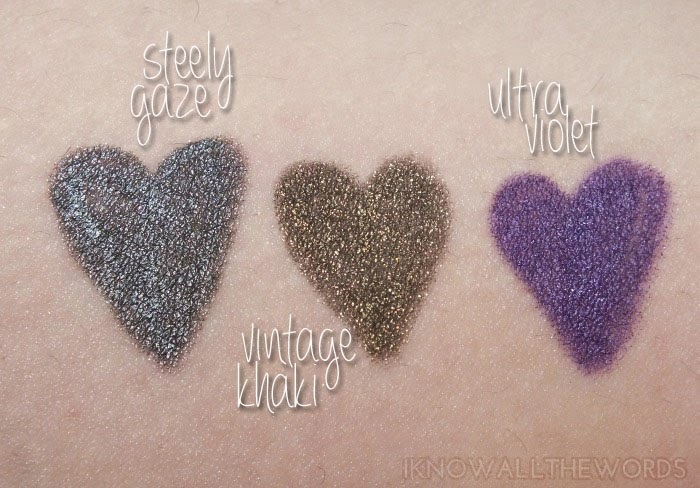 I did find Ultra Violet- a vivid, blue-toned purple- to be a little bit drier than Steely Gaze- a metallic, gunmetal- and Vintage Khaki- an antique golden-green- but it still applies quite smoothly and easily. These are also now housed in normal wood pencils. I haven't needed to sharpen mine yet, but based on appearance, I can't see anything that could hinder that process. Overall, I kind of love these! I already ordered myself one of the other shades- a grassy green shade named Grassroots- and another Ultra Violet for a friend. At a mere $10 these are a great liner to round out your collection if you're looking for a few new shades or are just starting a collection and need the staples. The formula is comparable to the Avon Mega Impact liners which also hold a special place in my makeup-loving heart ( I might just have six backups of Golden Fawn...) Tried these? Thoughts? What's your favourite liner?